Over decades of rigorous study and research, biologists have come to learn a great deal about the unique behavior of orcas in the wild. But the species' most profound characteristic - their bonds of family - take no advanced degree to understand. Late last week, a crew aboard a whale watching vessel off British Columbia began to pick up a series of unusual orca vocalizations on their underwater microphones. Nicole Mackay, who operates Mackay Whale Watching, told Canadian Broadcasting that the calls were "frantic sounding." And it soon became clear why. Moments later, the crew heard a fisherman reporting on the radio to the coast guard that a young orca had become tangled in his net. The whale watching boat was not far away, so they moved in to see if they could help. As they got close, the crew saw something remarkable. Although the trapped calf's pod could have easily swum away fearing for their own safety, they stayed by the youngster's side. As the lone fisherman, described as an elderly man, struggled with the net, the orcas began spyhopping from the water to watch what was happening at the surface. 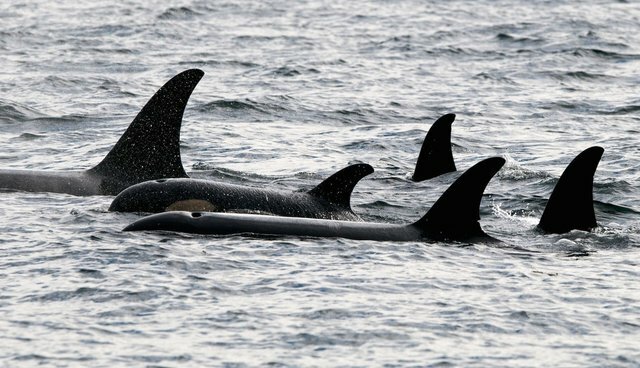 "The young orca belongs to the family pod called the I15's, the orca that was entangled is I103 its mother, two siblings and her aunt and two cousins were looking distressed waiting for the young orca to be released," wrote Mackay. "I 103 then began to sink to the bottom of the net under water and as it sank the family took a deep dive where they were under for approximately 12 minutes. We were all very stressed during this time as orcas typically hold their breath for up to 5 minutes only. We weren't sure at this point whether I103 was alive or not and were fearing the worst." Eventually, to the relief of the whale watching crew, the fisherman was able to draw the net up close enough to cut the animal free, ending his harrowing ordeal. Researchers arrived shortly after to monitor the freed calf and pod as they continued up the coast. Mackay says that she's never witnessed such a scene before, adding that it speaks volumes to the incredible loyalty the animals have to one another. "That family bond that those orcas have is so strong that they would not leave that whale. When it went down, they went down with it," she said. "It was really quite moving and terrifying at the same time." This scene stands in stark contrast to ones that took place in the region just a few decades earlier that had no happy ending. Up until the mid-1970s, orca calves were intentionally trapped in nets to be sold into captivity as their desperate pods watched on. Although capturing orcas has since been outlawed in Canada and the U.S., the tragedy of calves being torn apart from their families continues to this day at marine parks. Records show that SeaWorld routinely separates young orcas from their mothers at too young an age.